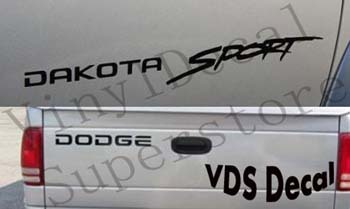 You'll get one pair DAKOTA SPORT stickers for your doors AND a single DODGE for your tailgate. DAKOTA SPORT decals measure approximately 3 x 26 inches wide each. The DODGE is about 2 x 19+ inches wide.